Sniper Ghost Warrior 2 is the next delivery of one of the best action and stealth games of recent times, thanks to the mixture of two genres much sought after today. 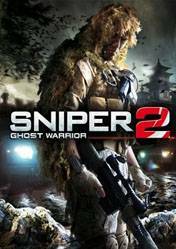 On the one hand, in Sniper Ghost Warrior 2, we will have the option to approach each of the different and varied missions in various ways, either from stealth or a sniper, which is thought to have to plan a combat strategy depending on The enemies that we are going to face and the terrain, or other route, which is the so-called "Rambo", that is, in front and with all kinds of short weapons. If we choose the path of sniper and stealth, we can enjoy long-distance killings thanks to our sophisticated sniper rifle, capable of reaching targets from miles away and undetected by enemies. It should be remembered that the first installment of this franchise did not have all the success that its producers would have wanted, that is why in this second installment they have decided to give a complete change both to the gameplay of the title and to the graphic section, Proves to have selected the reputed graphic engine CryEngine 3 to recreate all the effects and environments that we will move, which gives it a quality that its predecessor did not have.